Bruce Shapiro created the original “eggbot” in Spring of 1990 when he first became fascinated with controlling stepper motors from his computer. The original design was motivated by simplicity: drawing on a round object does not require any complicated mechanics. And since Easter was coming up, the obvious canvas was eggs. Since then, Bruce has created many art pieces and shop machines, including permanent installations in the U.S. and Europe (www.taomc.com). He even created a hi-res version of the eggbot, dubbed the Ovagraph. For Bruce, computer-controlled motion is a new frontier for art, but it is also a great teaching tool. He has taught classes at the Science Museum of Minnesota, San Francisco Exploratorium, and elsewhere using the eggbot to teach about electronics, programming, and robotics. These classes take a lot of work to prepare, but the feedback is always amazing. One of the goals of the Eggbot is to teach about the electronics, mechanics, and software needed to build your own motion control projects. We hope this project inspires you to explore the emerging field of home robotics as a medium for teachers, artists, and makers. 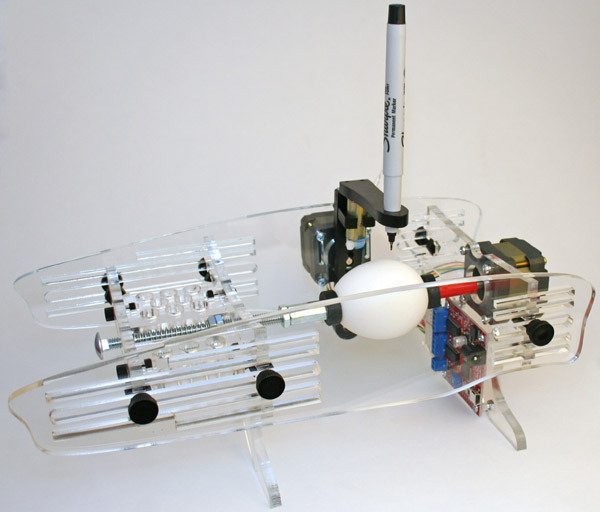 In 2009, Bruce teamed up with his son Ben Trombley and Brian Schmalz to turn the eggbot into a kit for home-assembly. Brian, an embedded-systems engineer, created the EggBotBoard which connects the eggbot to the computer over usb — one of many open-source boards that he has designed for connecting your PC to the outside world. (You can see more of them at www.schmalzhaus.com.) Ben was then a recent Stanford computer science graduate, and created the first version of the software that allows you to create drawings in Inkscape and plot them to the eggbot. 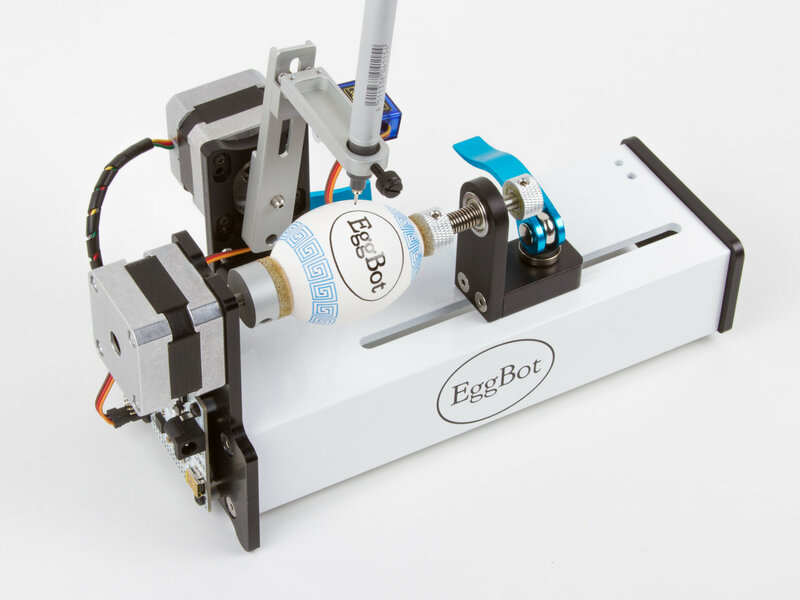 In 2010 the Eggbot team joined forces with Windell Oskay and Lenore Edman of Evil Mad Scientist Laboratories to introduce the new Eggbot 2.0 kit– a new version with a number of refinements that make it easier to get great results with the Eggbot. The Egg-Bot 2.0 kit was designed by Windell Oskay and Lenore Edman with extensive help from Bruce Shapiro and Brian Schmalz. A debt of gratitude is owed to our amazing beta testers and code contributors: Matthew Beckler, Peter Kropf, Tod Kurt, Lynn, Mark Moulding, Dan Newman, W. Craig Trader, and Bill Westfield. Extra special thanks to Dan Newman for above-and-beyond help on a number of fronts. 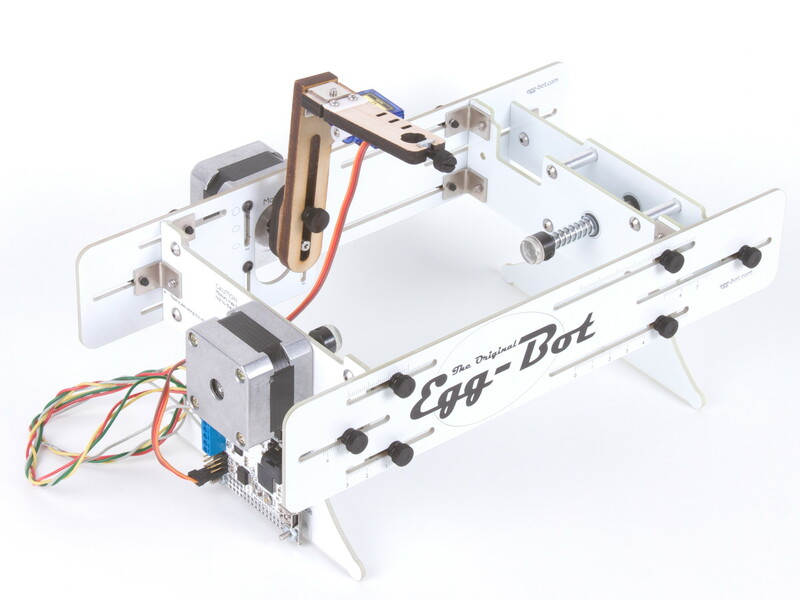 The new EggBot Pro, featuring a machined aluminum chassis, was released in August, 2014.